The Alist Chinatown World Tour is coming to Seattle. Got this news via Hip-Hop.net. You can click here for a bio on the artist himself, Allister Lee. Goods and Manik are proud to present the work of Alist ‘Chinatown’. The show opens Nov. 8th and runs through Dec 28th. Visually rich, multi-layered, full of details and brimming with energy, Chinatown is Alists’ preferred subject to gain inspiration while researching and executing his illustrative and creative work. His past clients include Nike, Stussy and Supreme. It‘s quite possible that you may find him amongst your busy Chinatown streets drawing quietly or continuing to explore new territory. Alist has currently undertaken a self-initiated, eight city “Chinatown World Tour”. The tour will document, illustrate and exhibit work that is influenced by each host cities’ Chinatown District. 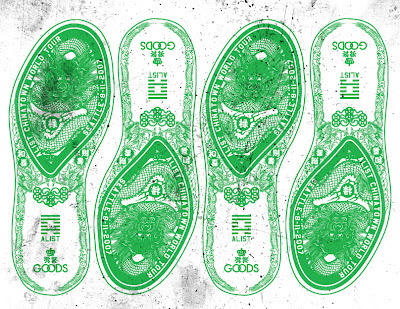 GOODS is the benevolent host of the Seattle segment of the tour which debuted in 2006 at the Reed Space in New York City. Other stops have included Nomad in Toronto and DPMHI Gallery in London. A well rounded artist, who specializes in using low grade materials to produce high end results, his haunting large format depictions of Chinatown streetscapes and other illustration featuring staples such as bootleg merchandise and discarded Chinese packaging. Other imagery is depicted using silkscreen processes or layered vinyl sticker paper. Found packaging is recycled to construct garments. Tins, bottles, and boxes are re-branded and arranged to make sculptural arrangements of Chinatown grocery shelves and street curb rubbish. Awnings, meat hooks, bamboo steamer trays and other omnipresent Chinatown items are all given new context when presented within each Alist Chinatown World Tour gallery experience.